CLICK HERE to Get a Poster for Your Practice Room, Bedroom, or Bandroom! Available in Many Sizes! CANVAS, FRAMED, POSTER -- YOUR CHOICE! 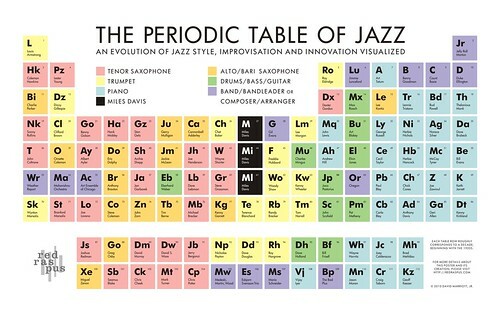 How Did "The Periodic Table of Jazz" Come Into Being? Many people know me as not just a performer, but also as an educator, and quite often I can be found teaching jazz history. But in my leisure, I'm a big fan of science fiction films and literature, and it seemed like I was seeing a periodic table of something or another on many of my sci-fi blogs almost weekly. A couple that recently caught my eye were the Periodic Table of Empire Strikes Back and the Periodic Table of Sci-Fi Film and Television. I saw those two links and thought to myself, "I may not be much of an artist, but I bet I could make one of those for jazz! I've been teaching jazz history for ten years and studying it my whole life, I can do this!" I did some searching to see if anyone had already done it, and with no results found I decided to begin my endeavor. After a quick count of the original periodic table's rows and columns, I made two quick decisions: one, that each row would equal a decade starting with the 1920's since I would be able to take the chart to the present; two, that with 18 columns, I would eliminate one to allow for a center column if needed (I could always put it back if I wanted to). After placing Louis Armstrong and Jelly Roll Morton as the tent poles of the 20's, I made a few other decisions in my logic: along the left, I would try to pick the two most dominant, innovative, or otherwise significant voices of the decade (I couldn't always make this work and didn't apply them to the last 20 years, but more often that not, I felt comfortable with those choices); along the right, I would populate piano players, in an effort to have at least one instrument be able to follow perfectly vertically across the decades. I filled in the pairings along the left fairly quickly through the 1980's and set to work on the rest of each row. Based on the choices and decisions I'd made thus far, I was starting to find the format of the periodic table quite limiting. With only eight names for the 30's and 40's, it was tough! I often found myself left with one square open and a difficult choice to make, so I let others make it for me. I defaulted to Gunther Schuller's The Swing Era in choosing Jimmie Lunceford, for example - I was leaning towards Fletcher Henderson myself. The overriding factors in my decision making were influnce and innovation within jazz improvisation and style. Many of my favorite musicians did not make this list -- you'll notice there are no trombone players. Take J. J. Johnson -- is he more important, more influential, more innovative or otherwise more significant than any of the eight I placed on the chart (Bird, Diz, Dexter, Max, Lee Konitz, Lennie, Bud and Monk)? You'd have a tough time convincing me of that. This was the argument I found myself in more often that not. "What, no Oscar Peterson?" "What, no Tony Williams?" Sadly, yes. But given the limitations of the setup, I made some difficult choices -- ones you might make differently, and I encourage you to do so, it is a wonderful exercise! I also found that as I got further down, the decade rule got looser, especially with more and more people crossing the 60's and 70's, or the 70's and 80's. So I decided to live with that, and just not be so strict. In the end, the evolution would stay intact whether I put Bill Evans in the 60's or 70's, for example. Plus, I felt obligated to represent as many different kinds of innovation as possible. The 1980's is about so much more than the "Wynton-Branford-"Young Lions"-neo-classicism (for example), as so many have written quite eloquently, yet I felt that in the end, or at least in twenty years, the 80's will still be thought of as mainly that movement. Miles Davis was another tough one. His voice, and those of his many progeny, reverberates so strongly through the 50's, 60's and 70's, that I felt he needed that "tree trunk" down the middle of sorts. This also gave me a rough area of the chart to gravitate trumpet players, as well as put people and voices connected to Miles near him. I thought about calling the group "Prince of Darkness", but decided making his category black was enough of a nod. I also tried to have fun. Many of the "element symbols" are nicknames or other references. I also had to include Horace Silver and Herbie Nichols with their real element symbols, thus the "Ag" for Horace Silver. The last 20 years are more difficult. What will the history books say about Craig Taborn and Geoff Keezer in 2030, for example? Were Medeski, Martin, and Wood a passing fancy? Will Miquel Zenon still be considered a "genius" in 2035? Those are much tougher questions to answer. I am not a critic, nor a fortune teller. I only know that time and time again, these people made "Best of Decade" lists by both critics, musicians and fans alike. I'll admit there are some sentimental favorites here and there since the 80's, and that's okay with me. This is "AN evolution" of jazz style, improvisation and innovation, not "THE evolution". The way I teach it may or may not be the way you would, and I'm okay with that. This is also an exercise more than anything - in a perfect world, I would make a list of all the important people and make a form that fits that list, not the other way around. Goals of "The Periodic Table of Jazz"
I wanted to make something of real value to a student of jazz music that would allow them access to the breadth and depth of innovation and variety in jazz music. I wanted to make something that could be used as a checklist for learning about the many approaches and strategies that musicians have taken over the years. I wanted to make something that a band director might have on their wall, or in a practice room for the students. I wanted to make something that I wish I had been given when I started my path in jazz music, to help guide me to the important, strong, innovative voices across all styles of jazz. I wanted to make something that mirrored a jazz history class curriculum, that a teacher could use as an aid in explaining stylistic evolution. I wanted to make something that objectively viewed jazz history, but also reflected my own views of it, if only slightly. When all was said and done, I showed this to many musicians I trust and respect. I had some arguements, some I won and some I lost. Part of me thinks this may continue to evolve as it becomes more public -- I'm up for that! Convince me! Who should be there and who should go? Last but not least, if you know someone who might like one of these, you can buy them at Imagekind. Personally, I wish I had gotten one of these as a high school or college graduation gift! Basic prints are about $10 at both, but you can get them in a variety of sizes, add frames, or super-size them however you like. There's a version on Flickr for download if you would like it as your wallpaper, but probably isn't suitable for printing. Feel free to use the contact page to get in touch -- I hope you enjoy!